Which is exactly what he was. As a young man, Jefferson carved Monticello out of a mountainside high above Charlottesville. After his presidency, he planted beautifully laid-out ornamental gardens, designed on the drawings he sketched into notebooks during his European travels. But Jefferson was, at heart, a farmer. He grew 125 varieties of fruit trees, half of which were peach trees. He planted gooseberries and currants that Lewis and Clark discovered along the Missouri River. He tried to grow grapes for wine, but the French cultivars failed to thrive – and likely would not have pleased the palate for fine wine he developed in Paris anyway. What did TJ sow? Many varieties of English beans, pumpkin from Africa, French lettuces, Roman broccoli, kale from Malta, New York corn, Swedish turnips, Prussian peas. He planted 40 varieties of kidney beans over the years, before finally settling on two favorites. And of course he kept the seeds sorted in a special cupboard. In the twilight of his life, Jefferson relished his agrarian roots at Monticello. “Tho’ an old man, I am but a young gardener,” he wrote. 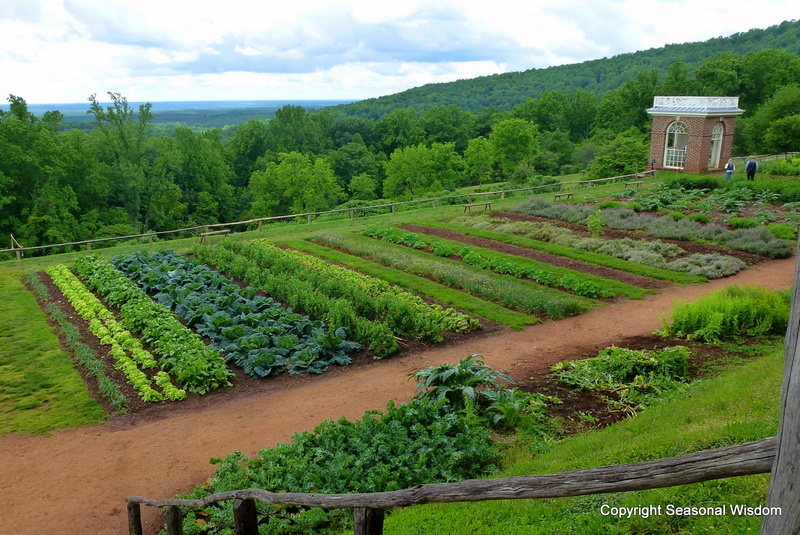 For more about TJ’s gardens, check out these videos from Monticello. And you can buy seeds and plants descended from his gardens online. I think a visit to the estate of my favorite president may be in order as his gardens awaken from the earth.